Palin has given a steady stream of interviews since Election Day. "Bored, anonymous, pathetic bloggers who lie annoy me....I'll tell you, yesterday the Anchorage Daily News, they called again to ask — double-, triple-, quadruple-check — who is Trig's real mom,” she said, in an interview to be published in the magazine’s March issue. “And I said, Come on, are you kidding me? We're gonna answer this? Do you not believe me or my doctor? And they said, No, it's been quite cryptic the way that my son's birth has been discussed. And I thought, Okay, more indication of continued problems in the world of journalism." The former Republican vice presidential candidate said again she regretted not taking a greater leadership role during the campaign season. "If I were giving advice to myself back on the day my candidacy was announced, I'd say, Tell the campaign that you'll be callin' some of the shots,” she said. “Don't just assume that they know you well enough to make all your decisions for ya. Let them know that you're the CEO of a state, you're forty-four years old, you've got a lot of great life experience that can be put to good use as a candidate." Despite a season of barbs aimed at the coastal elites, Palin seemed to offer an olive branch to the Big Apple: "I would think we all tear up during the national anthem at the beginning of a baseball game, don't we? That's an alikeness between Alaskans and New Yorkers," she said. Update: In an Anchorage Daily News column published last week, the paper's editor said the only questions reporters there had asked about Trig's birth came when the paper undertook a project to debunk conspiracy theories surrounding the event, but that they had abandoned the effort because of a lack of cooperation from the Palin family. Later, he added: "...So I don’t understand the behavior of the governor’s press office. Did the governor not share my email with the press staff? Did the press staff deliberately ignore what I said in order to have a longer list of press 'outrages'? Or are they just sloppy with details? I don’t know." Um, Sarah, bloggers don't make you dumber than a rock. It's just the way you are. I too wish Palin would just go away. I am still gun-shy over our 2-time election of Bush, and I feel like the longer she stays in the public eye, the more she will grow on people and we will forget her ineptitude. She may be a nice person, smart woman, etc. but I do not want her in charge of my country! Palin's excuse in this story about a factual statement that was taken "out of context" and mocked is completely and utterly ridiculous. Her quote: "The comment about, you can see Russia from Alaska. You can! You can see Russia from Alaska. Something like that — a factual statement that was taken out of context and mocked — what you have to do is let that go." This is a completely ridiculous statement because Couric set the context with painstaking and unmistakeable clarity in words even a 5th grader could understand. 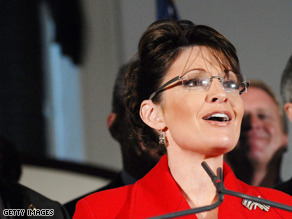 And she did it twice, rephrasing the question when Palin gave her initial response! It makes you think Palin doesn't understand what "context" means. If she says something factual like I can see Russia from Alaska to a question like "why are you familiar with Russia", then that clearly doesn't warrant being mocked. However, if she gives that answer to Couric's very intentionally specific question (quoted from the interview transcript) "You've cited Alaska's proximity to Russia as part of your foreign policy experience. What did you mean by that? ", that's a whole different ball game. How can Couric make it any clearer? Some say Couric is "trapping" Palin or being mean or unfair – that may or may not be debatable, but Couric's motives are entirely irrelevant as she is asking a completely reasonable question of a woman who may have been a heartbeat away from being the leader of our country! Palin could only reasonably feel "trapped" in this situation if she actually believed Alaska's proximity to Russia helped her foreign policy experience or if she feels completely incapable of extracting herself from a situation where she may have misspoke. The reality of the situation is Couric is providing Palin with a chance to provide a sound explanation for her comment or to dismiss it and say, "No, that's not really what I meant." Any politician worth their salt would have no problem getting out of this "tough" trap. Her answer does not actually answer the question how Alaska's proximity to Russia is part of her foreign policy question. She replies: "...Alaska has a very narrow maritime border between a foreign country, Russia, and, on our other side, the land-boundary that we have with Canada. It's funny that a comment like that was kinda made to … I don't know, you know … reporters. I can't imagine why a reporter would not follow up for a better answer from Palin here. They are on a long walk talking through a variety of issues – this is not a press conference where candidates can relatively dodge questions from a single reporter by calling on another reporter. So Couric rephrases the question with even more clarity! How can Palin argue her comments are taken out of context?!? So, right there, Couric pinpoints Palin's "foreign policy credentials". "Trade missions" back and forth, which Palin somehow feels are linked to national security issues. It seems like she's "sending out" people to "keep an eye on them" too, whatever that means. She might want to check with the CIA to make sure she's allowed to reveal that national security tidbit. It's not really that Palin is outwitted by Couric. It's more that she seems completely oblivious to that fact that she could not provide a reasonable answer to a clear, simple question and that she feels persecuted by the press unfairly for doing so. The fact is she provided a completely ridiculous answer and looks even more ridiculous trying to blame the press for taking her comments "out of context". How do we let these people get away with it??? I would love to Couric follow up and ask Palin to read the transcript and explain how her answer is out of context. But then Couric would be portrayed as mean. This is her job. Why do we blame the press for asking tough questions – really??? Look at the mess we're in because people are unwilling to persistently ask tough questions (and our leaders are resistant to answer them). I must stop as this truly makes my blood boil. I like seeing all these Palin interviews. She's cute, powerful, and not very smart. What's not to like? Who we blaming today Sarah? Give her credit though... she's qualified to spot a liar.... being such a huge one herself. PLEASE STOP GIVING THIS WOMAN A FORUM TO SPOUT THIS CHILDISH CRAP! THIS IS NOT NEWS. When she actually DOES something of merit or makes politically effective actions or commits actual or political suicide – then THAT is news. This drivel is NOT news – period. This not a printable story. This wouldn't even make the Alaska news services. Quit making her a spectacle even if she is initiating it. I cannot understand why Palin continues to bring herself into the limelight unless, of course, she enjoys it!!!! She has to be the most pathetic person I have ever heard who has had anything to do with politics. She should be dealing with the problems in Alaska. She is, after all, supposed to be their Governer or does she not realize this fact.